The Professional Regulation Commission (PRC) officially announced on Thursday, September 10, 2015 that 2,536 out of 3,772 Registered Electrical Engineers (REE) and 1,886 out of 2,993 Registered Master Electricians (RME) successfully passed the Electrical Engineer (EE) board exam given by the Board of Electrical Engineering in Manila, Baguio, Cebu, Davao, Iloilo, Legazpi, Lucena and Zamboanga this September 2015. PRC named 5 schools which garnered the highest percentage of passing based on Commission Resolution No. 2010-547 series of 2010. University of Santo Tomas (UST) is the top performing school for the Registered Electrical Engineer (REE) board exam for its 98.61 passing rate or 71 out of 72 passed the exams. De La Salle University- Lipa, Technological University of the Philippines (TUP) - Manila, University of Southeastern Philippines (USEP) - Davao City and Southern Luzon State University (SLSU) - Lucban ranked second to fifth respectively. 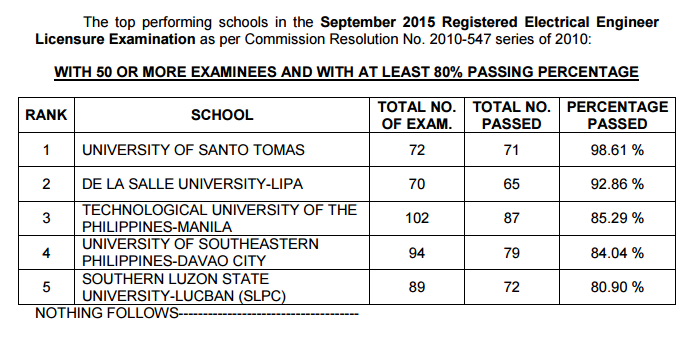 Meanwhile, three schools made it to the top performing schools rank in the September 2015 Registered Master Electrician (RME) Licensure Examination as per Commission Resolution No. 2010-547 series of 2010. Bohol Island State University (BISU), Technological University of the Philippines (TUP) - Manila and Southern Luzon State University (SLSU) - Lucban got 92.16, 88.24 and 80.00 percent passing rate.